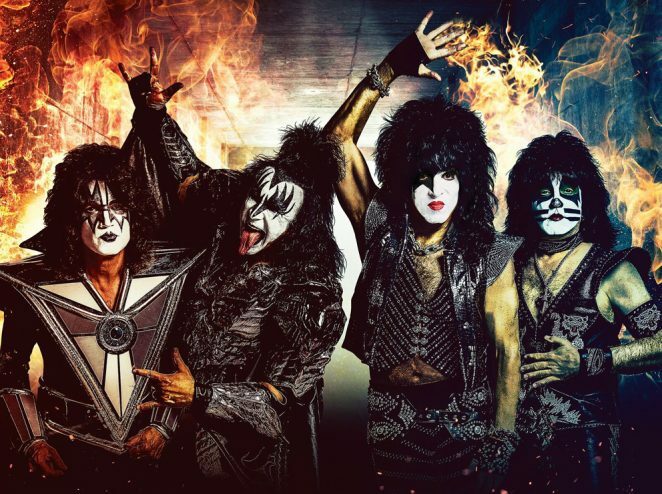 After an epic and storied 45-year career, resulting in the selling of more than 100 million albums worldwide, rock n roll legends, KISS recently announced that they will launch their final tour ever in 2019, appropriately named END OF THE ROAD. The Australian leg will kick off in Perth on 16 November 2019, moving through Adelaide, Melbourne, Sydney and Brisbane. 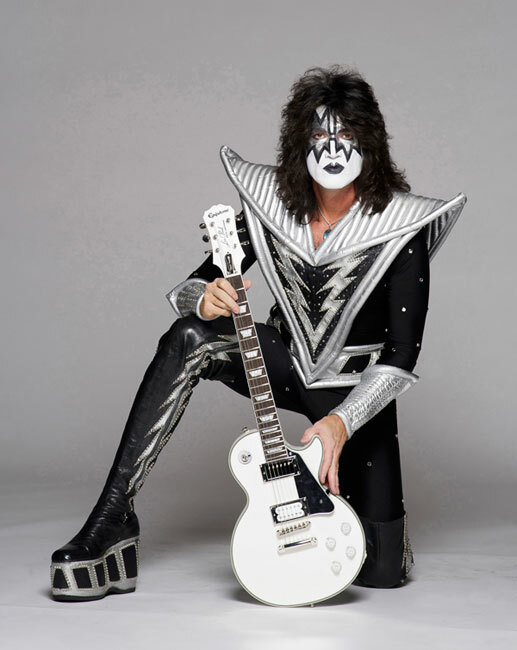 As the current lead guitarist for the legendary rock band KISS, Tommy Thayer’s career in music has been more than a dream come true. Tommy’s passion for early 70s hard rock bands, including Kiss drove his desire to pick up electric guitar at age 13. After graduating from high school, Tommy eventually formed his own serious hard-rocking act, Black ‘N Blue. Touring for two months as opening act for KISS in 1985, Black ‘N Blue soon befriended bassist Gene Simmons and asked him to produce the band’s next studio album. Gene noticed Tommy’s skills and work ethic, in turn asking him to write and record song demos with him for KISS. By the late 80s Black ‘N Blue had run its course, leading to part-time employment in the KISS camp, writing songs, recording demos and taking care of day-to-day business. By the early 90s, it had become a full-time job. Australian Musician’s Greg Phillips recently had the pleasure of chatting to Tommy Thayer about Kiss, the Australian tour, his gear and more. Tommy, your first instrument was the saxophone. A lot of guitar players tell me that they are inspired by saxophone lines. Do you feel that sax has been an influence on your guitar licks? It definitely broadened my musical horizons to begin with. I started playing saxophone in the school band. I was in 5th grade, maybe 11 years old. I grew up in a real musical family and my mum was super artistic, a great musician and beautiful singer. We had great music around the house growing up, classical music, Broadway albums … Rodgers and Hammerstein and then my older brother was playing Beatles records, so it was a great environment. I picked up the saxophone when I was eleven years old and I think just being in the school band and playing, learning to read music and learning theory, just going through that process probably helped me to open up more musically. I started guitar when I was about 13 because I loved the bands and rock ’n’ roll music that was happening in the early 70s. So I picked up the guitar but did play saxophone through to when I finished high school. It definitely influenced me and opened my eyes and ears and broadened my perspective for sure. What do you remember about your first ever gig with Kiss? My first official gig as lead guitarist in the band was actually in Australia in Melbourne at the Telstra Dome for the Kiss Symphony concert in 2003. So that was my first official gig but a year prior to that, I’d done a few shows in early 2002, almost just filling in because they didn’t know what direction they were going at the time. They had done a farewell tour of sorts as you know in 2000/2001 because the original band that reunited in 96/97 was falling apart again and I don’t think they exactly knew what they were doing. In 2002 the first gig that I did with them was a private show in Jamaica. It was very interesting. It was this very rich Russian gentleman that was turing 30 and he had all of his friends there. So it was just a couple of hundred of his friends and all of these models and strippers and all kinds of crazy, hedonistic things going on at this resort. We played and it was a full production, big stage with everything going on but it was bizarre because it was really a private event. That was my first one and I was a little nervous but excited and obviously blown away that this was actually happening and I was on stage in make up performing with Kiss. How long did it take to feel like you were part of the band as opposed to being the new guy? I’ve been the new guy for 17 years so I dunno! Took me about 15 years to get comfortable though. It has been a process to be honest with you. Although it has been exhilarating, particularly in the beginning it was a little nerve-racking filling big shoes to begin with and coming in with a lot of expectations from people … not the band, just people in general. It felt like I worked real hard and I was very diligent and I believe everything has worked out just fine and it’s always a growing process and learning process, no matter what you are doing. Even if you have been in the band 17 years, it’s always evolving. I think all the guys feel that way. There’s always something new coming up and that’s what keeps it interesting. How have you approached the famous Kiss guitar solos? Have you put your own flavour into them at all or kept them as they were? All of the classic Kiss guitar solos I have actually tried to be true to the original form, the way the solos were written and performed in the first place, especially the earlier 70s stuff. That’s really what I grew up with. When I started playing guitar, it was the first 3 Kiss albums … the studio albums and then Kiss Alive came out in 1975 and that was the template for me. There were other guitar players at the time, Jimmy Page, Robin Trower, Peter Frampton but also Ace and that’s what really formed what I became as a guitar player. I want to play those songs note for note as best I can. On the 80s stuff there is a little bit of a readjustment that has to go on there because I never really played the hockey stick guitars, you know the Floyd Roses that were popular in the 80s. I played a little bit I was still always playing a Les Paul through the 80s. I have always been a traditionalist in that sense as far as approach. So when we do the 80s stuff, I adjust a little here and there because I don’t have a wang bar and don’t really want a wang bar. I like to be as truthful and as honest and as faithful though with all that stuff. You have several signature guitars. What are the most important elements of your signature guitars they had to get right for you to put your name on it? Again, I am very traditional with my tastes. I grew up in an era where you had Gibsons and you had Fenders. Gibson Les Paul was really the ultimate rock ’n’ roll guitar, even though it didn’t start out that way when it was first developed by Les Paul but it became what Jimmy Page and Jeff Beck and all these guys played. A lot of the guitar players I really liked when I started to play like Ace or Ronnie Montrose or Peter Frampton, they were playing Les Pauls, so eventually I had to have one. I just like a really basic guitar like that and I believe you should have a good guitar, a good amp and just plug it straight in and make it happen with your hands. I use a few effects but not much at all. It is pretty much guitar plugged into an amp for me and I think that is a really important, fundamental thing. A lot of people get swept up in effects and it’s interesting and I think maybe that’s the sound for certain bands and certain music but I have always been more traditional, more straight ahead .. a good guitar that is set up well, feels right. My signature guitars … again, the first two were Les Pauls with Epiphone. The basic set up and the dimensions, the neck profile is all very classic … like a ’58 Sunburst Gibson Les Paul, with basic pickups. Really it comes down to just the finishes, something that cosmetically looks flashy, a sparkle and colour that would look good on the Kiss stage. The first one was the Spaceman Les Paul with Epiphone and it was a sparkle top, chrome hardware and the back, neck and headstock were all painted black. The second one was the While Lighting Les Paul and that’s really my favourite. It is an alpine white, metallic finish, white/black binding, the whole guitar is white though except the neck. It’s got all chrome hardware on it too which really looks nice with the white. The third one was a White Lightning Explorer, so it was the same things as on the Les Paul but an Explorer body. They have all done really well and sold out, the limited edition runs, so we have probably sold 3 or 4 thousand guitars. The great thing is that those Epiphones are priced reasonably so that almost anybody can afford them. Kiss fans can buy an 800, 900 dollar guitar because they want to put it on a wall. They collect this stuff and I think it’s great because the Gibsons are fantastic but they get a lot more expensive, you’re talking 5 or 6 thousand dollars for a guitar. So I’m really happy with the Epiphones, not that they’re not for professional musicians, they play really well too but for fans who want to collect it works out too. Are you still looking at gear possibilities for this tour or are you pretty happy with what you’ve got? It’s interesting that you ask me that. About ten years ago I discovered Hughes and Kettner, which is the amp that I use now and I have a friend who turned me onto them and we put together a deal. I ended up with this hundred watt amp, it’s called a Duotone but there’s a Tommy Thayer signature model of it. It’s a real arena amp, it’s a hundred watts, very powerful, very loud. It looks cool too because Hughes and Kettner have that blue light that turns on. I have used them through the years and have been super happy. All of the guitar players that I admire who come to the show say to me, don’t change your sound, your whole set up is really sounding good. So I have stuck with it but Hughes and Kettner have come out with another amp in the last few years called the TubeMeister, which is a smaller amp. They started with a combo, a 10 inch and then 12 inch combo and then they did a small head that was maybe 35 watts. It could drive a 4×12 but it wasn’t as loud. Then they did a little bit higher wattage version of the TubeMeister called the GrandMeister which was 40 watts. The reason I am telling you that is that recently as we’ve been rehearsing, I’ve been using those GrandMeister 40 watt amps and they really sound great. I was doing some recording recently, not with Kiss but some other stuff and I used that and it sounded phenomenal. So I thought maybe I should try to transition into those amps because I think tonality wise they might be better than the DuoTone, even though the DuoTone is really good. We did private gig about a month ago here in LA and I used two of the GrandMeisters with two 4x12s and it was good but just didn’t have the velocity on a big stage, especially with a band like Kiss. When we went to the Kiss cruise two weeks ago, I had the GrandMeisters and I AB’d them against the old tried and true DuoTones. The DuoTones still killed it. To have that velocity, capacity and power … it’s what I really need up on stage, so I am right back where I started. I am still using the Hughes and Kettner Tommy Thayer Signature DuoTones and will be using them on the Kiss End of the Road World tour starting in January. I have four at least of them on the road with me and using two at a time, do two 4x12s on stage and have two back ups. Have you thought much about the tour from an audience perspective? Every gig is going to be both exciting and emotional for each fan? It will be and I think emotional is a good word. Some people say it’s going to be bitter sweet. I don’t think it will be bitter sweet. It will be sweet but celebratory and I think emotional because literally this is … without it being a gimmick … the last tour legitimately. Paul and Gene have done this a long time and with the physicality of a Kiss show, they want to go out doing it well. Each city we play in, it’s going to be the last time we play there. I mean this tour could go for a while because we are going to be hitting as many cities around the world as we can but it will be emotional, not only for us but for the fans too. This is also the last opportunity for people who have never seen a Kiss show, so they need to go because Kiss has always been a must-see. You were tour manager for kiss at one point, what was the most difficult aspect of being tour manger of this band? That was the toughest job I have ever had in my life. The story behind that is that I had a band in the 80s called Back and Blue and we were the opening act on a Kiss tour in 1985. That’s when I met Gene and Paul and at the time Eric Carr was playing drums with Bruce Kulick on guitar. Gene embraced us and produced a couple of records and then he turned around and asked me to write with him for the Hot In The Shade record and we wrote a couple of tunes. After Black and Blue ran its course, they asked me to come and work with the Kiss organisation, which I gladly did. It was a great job and I started part time but to begin with, I just did everything. In 96/97 I started going out on the road and even before going on the road I’d worked with Ace and Peter in the rehearsal theatre to help them re learn their parts because they weren’t up to speed on a lot of stuff. Anyway we got on the road and I was kinda helping out and the road manager they had got sick or something and had to go home so they said, well Tommy you are going to be the tour manager now and I just took over. It was a very demanding job. I like to look at it as being good conditioning for me because that’s a tough 24/7 job and it’s kind of thankless because everybody is pummeling you all day long and you need to make sure everything is taken care of. It’s an endless commitment and responsibility but it was good learning. I did that for a few years but also I was recording and rehearsing with the band and writing, doing a lot of stuff. So by the time they were having problems with Ace Frehley again, I was there and was basically the go-to guy. It was like well Tommy’s here and it has to be him because he knows what’s goin’ on, plus there’s a comfort zone between me and the guys which is important. A lot of people don’t realise that … the fact that you respect each other and are comfortable with being around each other all the time, it’s really important. Especially as you get a little older, people don’t want to screw around they want to be comfortable. I think we have that. On the other hand you have to be able to play well and fit the role too obviously but there is a lot more to that dynamic than most people probably think of. Kiss have always been the masters of pyrotechnics, I’m wondering if you’ve ever got too close to the fire and explosions? It happens! You know none of us has ever really had a problem though. It’s all so professionally done, especially in a an organisation like Kiss and the pyro company. Everything is very choreographed and thought out. Knock on wood, we haven’t had any problems. It’s interesting that you ask that though, so many bands today, you watch these award shows on TV or you see a country act or hip hop act and they’re blowin stuff up and confetti is falling at the end of the show … that all comes back to Kiss. That is the Kiss DNA but at the end of the day it is not Kiss. That’s why, even though we have been around a long time, it is really our thing. Two weeks ago we went and did a huge pyrotechnics demo at the Forum in LA, this huge arena. We needed a place like that to look at the pyro and critique it. We want to have the biggest and baddest pyro just like everything else. Even though you have all the imitators coming up using the stuff, it doesn’t make it Kiss and you have to be at a Kiss show to really see how it is done, the best way and original way because Kiss was the band that started all that stuff, you’re right. 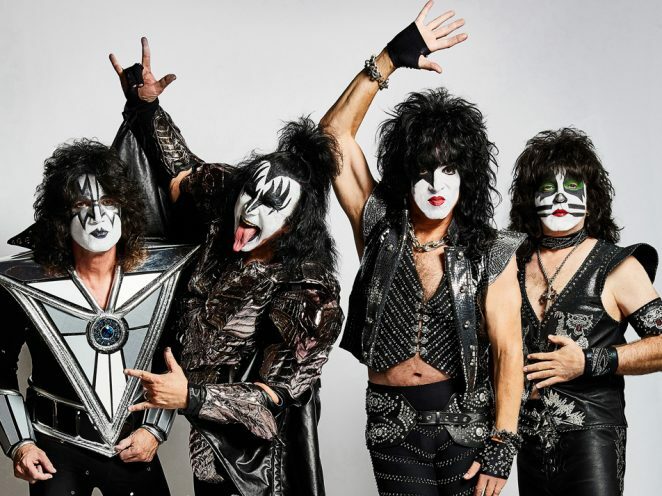 When this tour is all said and done, then what for Tommy Thayer? I’m just going to ride off into the sunset, ha! You know I am younger than those guys, I’m the new guy and I think that first of all, this tour could go for a while but I’m always going to be busy doing things and it’s not like Kiss is going to go away either. You still have the Kiss brand, you have the logo, you have the music. It is still going to be the living breathing animal that it is but it won’t be this touring band. I have other interests too, I have philanthropic things and other music I am doing, animation projects. I am interested in a lot of different things, so I will still be busy.